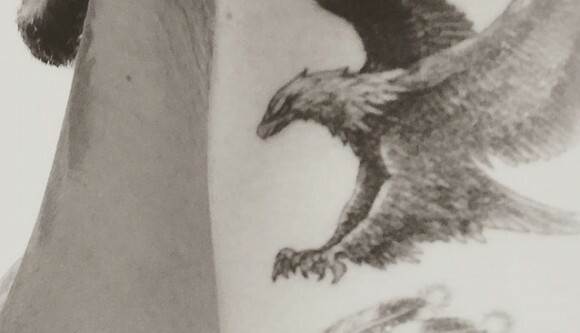 David Beckham took to Instagram to show off his new side tattoo, and in the photo, you can clearly see his tattoo of the eagle, inked in black and white and featuring a pretty fierce-looking bird. David captioned the Instagram pic, “Just another…RISE ABOVE @shamrocksocialclub,” which means his new ink was done by the infamous Hollywood-based tattoo shop Shamrock Social Club. While showing off his new eagle side tattoo, David Beckham also inadvertently debuted a never-before-seen tattoo on his side featuring what looks like the head of an Indian chief. Apparently, David got his Indian chief tattoo a few years ago, but this is the first clear glimpse we’ve gotten of the ink. D avid Beckham is one of those people who gets a tattoo because it has an important meaning to him, and in his autobiography, he explained, “[My tattoos] are all about the people in my life, my wife and sons, who I want with me always. When you see me, you see the tattoos. You see an expression of how I feel about Victoria and the boys. They’re part of me.” It makes sense then, that when the Beckham’s first daughter, Harper, came along in 2011, David went under the needle for an adorable “Harper” tattoo on his chest, and then went back for a “Pretty Lady” tattoo above it following her fourth birthday this year. These two tattoos on David Beckham’s side may not be tributes to his wife and kids, but we’re betting the ink holds a personal meaning for the 40-year-old. Based on the caption he included in his Instagram post, David’s new eagle tattoo represents “rising above,” possibly either referring to a challenge in life or something difficult he has to overcome. As far as David’s Indian chief tattoo though, the soccer star has yet to explain the meaning of the ink, which looks an awful lot like Justin Bieber’s tattoo of an Indian chief on the back of his shoulder, doesn’t it? 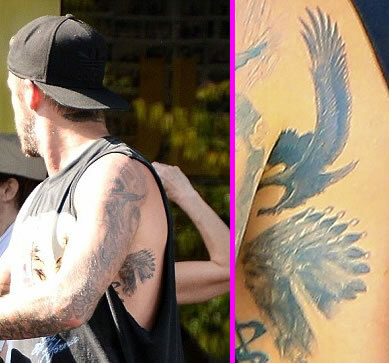 What do you all think of David Beckham’s eagle and Indian chief tattoos? ?